MUNICH — The recession gripping the world's automakers hadn't hit when product plans were hatched several years ago for many of the vehicles that will be displayed at the Geneva auto show. That means this year's show will have more world debuts than might be expected during such dour times. The show will feature more than 30 debuts. Those include much-anticipated introductions of the Volkswagen Polo, Mercedes-Benz E-class coupe, Fiat 500 Cabriolet, Aston Martin V12 Vantage and two models from Audi. Concept vehicles from BMW, Ford, Nissan, Hyundai and Kia also will be shown. Although many have been developed solely with the European market in mind, some will make their way to the United States soon. Here's a sampling of some of the vehicles debuting in Geneva during press days March 3 and 4. -- BMW Gran Turismo. Using the 5-series platform, BMW has developed a concept for a five-door premium hatchback. BMW describes it as a "progressive activity sedan" and calls it the Gran Turismo. It's designed like a four-door coupe, with frameless side windows. A large, two-piece tailgate gives access to a luggage compartment that grows to 58 cubic feet when the rear seats are folded down. A production version is expected to be unveiled at the Frankfurt auto show in September, and sales are expected to begin in the fourth quarter. BMW plans to sell fewer than 100,000 units of the car annually. It will be priced from 37,000 to 65,000 euros (about $46,600 to $81,900) in Europe. U.S. prices were not announced. The public gets its first look at Mercedes E-class coupe in Geneva. -- Mercedes-Benz E class. Last month in Detroit, Mercedes-Benz gave journalists a peek at the redesigned E-class sedan. But Geneva will mark the public debut of the car and the world debut of the E-class coupe. The E class is the lead vehicle for Mercedes' modular powertrain strategy, which requires any four-cylinder Mercedes engine to work with any Mercedes car model — including the transverse mount of the A class and the longitudinal layout of the S class. The E-class sedan goes on sale in March and the coupe in June. -- Infiniti Essence. Infiniti will unveil the Essence concept, a sporty performance car. The Essence will hint at the design and technology direction the Japanese luxury brand will take with new models starting in 2010. -- Audi A4 Allroad. The redesigned A4 Allroad enhances off-road capabilities of the A4 Avant wagon. The Allroad rides three inches higher off the ground than the Avant, at 7.1 inches. Its enhanced stability control improves traction during off-road driv-ing. The Allroad goes on sale this summer. Saabs 9-3X has all-wheel drive and off-road capability. -- Saab 9-3X. 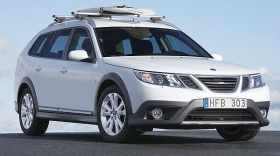 Saab is trying to toughen its lineup with this version of the 9-3 wagon. The 9-3X has additional off-road capabilities and all-wheel drive. Production is scheduled to start in September. -- Rolls-Royce EX200. Rolls-Royce will display the EX200 concept, which is smaller than its Phantom sedan. The concept previews a small Rolls-Royce sedan scheduled to go on sale in the first quarter of 2010. Some sources suggest the historic Silver Ghost nameplate will be used. The EX200 will be powered by a new 12-cylinder engine. -- Aston Martin V12 Vantage. Aston Martin will improve the performance of its small coupe by stuffing a 6.0-liter V-12 into its engine bay. The engine produces 510 hp and 420 pounds-feet of torque, resulting in 0-to-62-mph acceleration of 4.2 seconds. Production will be limited to 300 to 500 units annually. Deliveries will begin in the third quarter. Pricing will be announced at the Geneva show. -- Mazda3 MPS. Mazda will unveil a redesign of the MPS, known in the United States as the Mazdaspeed3 pocket rocket. The car features Mazda's 2.3-liter turbocharged four-cylinder engine that produces 260 hp and 280 pounds-feet of torque. The U.S. version, which will continue to be called the Mazdaspeed3, could arrive in U.S. showrooms this fall. -- Volkswagen Polo. The redesigned Polo, Volkswagen's No. 2 seller, will be one of Geneva's most important debuts. Normally the Polo would not be of interest to Americans, but the recent trend toward fuel economy has VW wanting to introduce the car in the United States. The redesigned Polo goes on sale in Europe in late summer, with the potential for a 2010 American introduction.